Made from scratch in the Flavor kitchen, our ready-made meals are fully cooked and prepared meals ready for you to enjoy. Pick up. Heat up. Serve up. Enjoy! St. Louis Boutique Catering + Hand-crafted Bites For All Of Life’s Occasions. Add flavor to your event, lunch meeting or gathering around your own kitchen table with Flavor 360. We create experiences where our locally-sourced, hand-crafted dishes can be enjoyed while giving you the freedom to celebrate life's occasions - big or small. Whether we set up and serve, deliver to your door or you pick up on the way home, we can't wait to share the flavor with you. Our Kitchen is Your Kitchen. Now sharing ready-made meals, we truly are your everyday kitchen! Are you having a busy day but still want to put something homemade on the table? With Flavor 360, you can. Have an impromptu guest showing up this weekend? Our ready-made meals are your answer. Pick up, heat up and serve up. We'll take care of the food so you can focus on the conversation. The Flavor 360 kitchen dishes up experiences to uniquely fit your needs. From the first taste to the last bite, your event is your own. Every single bite is hand-crafted from scratch with the very best local ingredients. Our kitchen prepares each dish with care and attention to flavor. Memorable menus, from-scratch box lunches, or ready-made meals for your busy life – Flavor 360 does it all for you. As part of our commitment to supporting the environment and encouraging eco-friendly practices, we are constantly seeking innovative ways to use green practices in our kitchen and share them with our customers. Our custom gift boxes and tasty bakery items are great treats for all of life’s occasions - because all occasions deserve more Flavor. Creating an enjoyable, natural and flavorful dining experience for you while supporting local farmers and caring for our earth. Sharing a meal is a beautiful place to connect with one another. I love the joy that gathering around a table can bring. Creating the perfect flavor combinations to accompany your event, the healthy addition to your lunch meeting or the right mix of hand-made touches for your weekend guests are why we do what we do. We create in the kitchen because we love it. Let us do the "work" while you enjoy your guests. I can't think of a better gift to give you than that. Enjoy! Sign up for monthly Flavor 360 Kitchen offers, discounts and exclusive news! 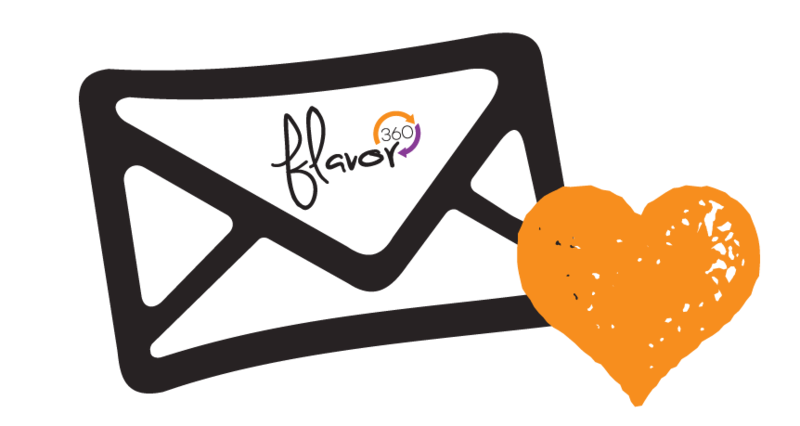 By submitting your email, you are agreeing to receive exclusive content from Flavor 360. You can unsubscribe at any time. ©2018 Flavor 360. All Rights Reserved.